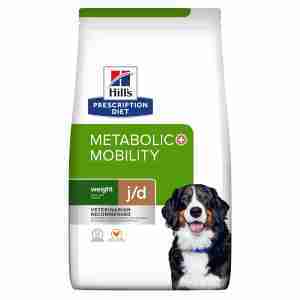 Hill's Prescription Diet Canine Metabolic Plus Mobility for dog has been developed to improve mobility and reduce weight. This clinically proven dog food was specifically designed to offer weight management and joint care. Hill`s Prescription Diet Canine Metabolic Plus Mobility encourages your dog`s body to burn fat instead of keep it. The formula contains glucosamine and chondroitin sulphate which help to build cartilage, ligament and joint oil. Effective levels of EPA and Omega 3 fatty acids help soothe the cartilages improving your dog`s mobility. Antioxidants and vitamins along with beta-carotene maintains immune system healthy. Also, this blend has everything your dog needs to keep him full between meals. Often the best way to deal with an overweight pet is to make him exercise more and eat less calories. With Hill's Prescription Diet Canine Metabolic Plus Mobility, within as little as 21 days you can see improvements in mobility and a reduction in body weight by 13% in 60 days. When healthy weight is achieved, feeding amounts need to be adjusted to maintain ideal weight. Wheat, maize gluten meal, pea bran meal, flaxseed, chicken (11%) and turkey meal, digest, tomato pomace, cellulose, dried beet pulp, fish oil, coconut oil, minerals, L-lysine, DL-methione, dried carrots, pork cartilage (source of chondroitin sulphate), taurine, crustacean shell hydrolysate (source of glucosamine), trace elements and beta-carotene. With a natural antioxidant (mixed tocopherols). Vitamin A 28500 IU, vitamin C 122 mg, vitamin D3 1670 IU, vitamin E 675 mg, iron 277mg, beta-carotene 2 mg, iodine 4.1mg, calcium 0.78%, copper 35.2mg, manganese 12.2mg, Omega 3 fatty acids 3.2%, phosphorus 0.53%, potassium 0.87%, sodium 0.32%, zinc 236mg, selenium 0.6mg. Well 4 weeks into her weight regime and being really strict with regards to treats, she has lost nearly a kilo. So great progress in a short period, she still has 3 or so kilos to go but this food certainly seems to be working. A slow introduction to the food over a period of a week, but she has taken to the new food. You will also notice a difference in your dogs poo, much firmer due to the fibre content, so easier to pick up. Following the instructions results in steady weight loss. Whilst not a fussy eater my cavalier enjoyed it from day 1. Order was smooth but delivery slower than expected. This product does what it says - helps to control weight and , by doing this, increases mobility.